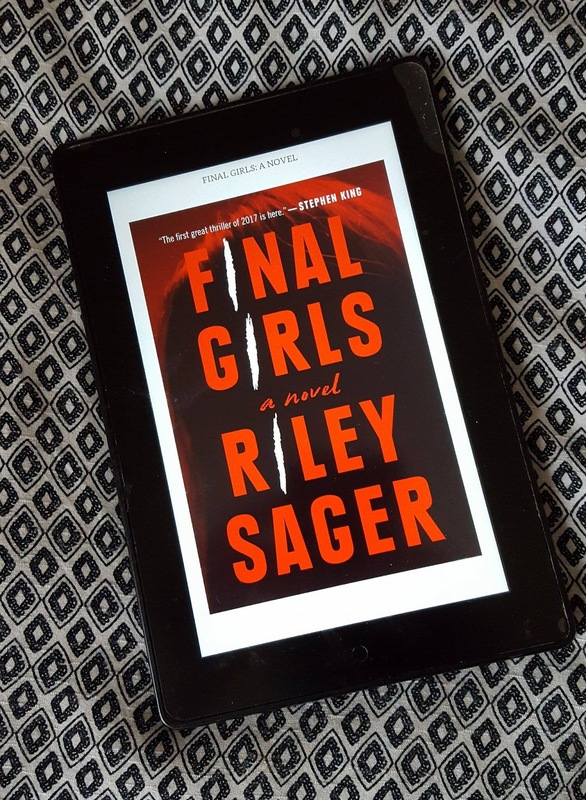 Today, I have a review of perhaps one of the year's most highly anticipated thrillers, Final Girls, by Riley Sager. When Stephen King blurbs for the cover, saying, "The first great thriller of 2017," you know it has to be read! Back in January, I spotlighted in a Top 5 Wednesday post that this book was one of my most highly anticipated reads for this year. There was a lot of hype surrounding it and that didn't seem to dissipate once it was finally released in July. I was super excited to receive an advanced copy and tried to dive into this one as quickly as I could; however, this did not turn into the thrilling, page-turner that I had believed it to be. I don't think that this is the book's fault, but rather a case of my expectations being a lot higher going into it. The story was ultimately an enjoyable read given the subject matter and would be a great place to start for those looking to get into the thriller or horror genres. It's dark, but not dark enough to turn off curious readers. I'm not a huge horror fan much less horror films, so I was not familiar with the "final girl" archetype. This idea of the last girl standing still having to fight years later after surviving her ordeal was really intriguing to me. Quincy tries to present herself to family and the outside world as the perfect survivor despite having obvious internal conflict with her past. She's now a baking blogger and everything about her life appears "cute" and "sweet." She doesn't make a big deal about the massacre, largely because she can't remember what happened, and no one else around her brings it up. It's only when another final girl, Sam, comes knocking that Quincy begins to really confront what happened to her all those years ago as well as what it means to be the only survivor. While the story is largely happening in the present, there are small flashbacks throughout that gradually reveal what happened that night to Quincy and her friends. I enjoyed reading these scenes, and interestingly, they aren't written to reflect Quincy's memory returning, but rather, as a true account of what happened. It was very subtle and gripping, which definitely helps to keep the story going because I had such a difficult time staying invested in the present situation. Everything began to drag and feel repetitive with so much unnecessary drama, especially for a character who had steered clear of such turmoil for so long. Surprisingly, in the end, there is more than one big reveal, but everything happens so fast that it wasn't exactly a satisfying or complete conclusion. I enjoyed all the red herrings and never saw the ending coming even if it was incredibly disappointing. I think the atmosphere of this story lends itself greatly to being read in the fall as we get closer to Halloween. I have no doubt that this will be a book that many will lose themselves in, but in the end, it was just a good read for me. Nothing mind-blowing, but definitely worth the time. Many thanks to NetGalley, Penguin Group Dutton, and Riley Sager. It was a pleasure reading this book and providing a review! WOW. Great book!! This story has a great plot with lots of twists and turns. Did not expect the twist towards the end of the book. Recommend this as a must read.